This is undoubtedly one of the finest downland courses in Europe. Fast, undulating fairways allow you to chase the ball into position. The International Course at London Golf Club is punctuated with exciting risk and reward tee shots over water that really get the heart pumping. Home of the 2014 Volvo World Match Play Championship, The International recently hosted both Regional Open Qualifying and European Tour Qualifying School. Designed by Ron Kirby under the Nicklaus Design banner, the International opened for play in 1993 and it represents a tough links-like challenge. The gently rolling Kent countryside provides sufficient elevation changes to make things interesting, and from the tips, which measure a little more than 7,000 yards, it’s a really tough challenge for all except the very best golfers. A valley separates the outward nine from the inward half, giving the International a distinctly different feel and also some spectacular views. Four lakes make watery graves for numerous golf balls and they come into play on five holes. 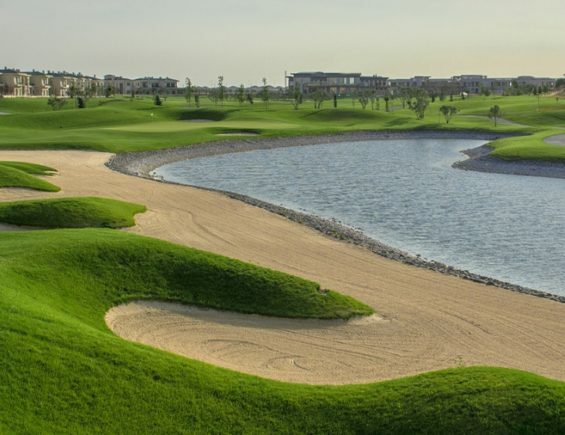 There are also plenty of sand traps in various shapes and sizes, from small pot bunkers to enormous expanses of sand. “The best par 5 hole I have ever created” is how Ron Kirby describes the 532-yard 4th, which features a fairway that is split in half by a huge bunker, providing a risk and reward option for the bigger hitters. You can choose to play the hole the long way round the lake or you can try the shorter but riskier direct route across the huge lake. Are you up for the challenge? The International course has hosted both Regional Open Qualifying and the European Tour Qualifying School. However, the biggest event to grace the International’s fairways was the 2014 Volvo World Match Play Championship, which resulted in Finland’s Mikko Ilonen sealing the biggest win of his career.